The HydroTube™ offers a better, faster way to clean windows up to 5 stories safely from the ground. 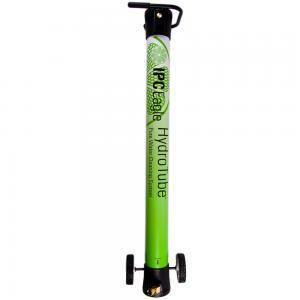 The HydroTube™ moves easily in and out of vehicles, up and down steps, and across any terrain. The HydroTube™ has the unique ability to product a high volume of pure water on normal tap pressure. The possibilities are endless and the system can be upgraded at any time with an electric or gas module. This includes a 4 stage filtration system which includes reverse osmosis, and deionization process to produce mineral free water providing for incredible cleaning action and spot free windows. It weighs only 28 lbs, is easily transported in and out of vehicles, rolls effortlessly on sidewalks, grass and up and down stairs. It operates laying down. It produces pure water at less than $.03 per gallon and cleans up to 3 stories without a pump (based on incoming tap pressure). It works on tap pressure only; an electric pump can be easily added later to increase productivity in low pressure areas or when two poles or extended height is required. It is equipped with 50' of hose, a TDS meter & filter set. You can easily change filters require no tools.